Our Skye adventure began early in the morning. We had planned making a few stops along the way, and were looking forward to seeing the beautiful Isle of Skye again. After making stops at Tyndrum and Fort William for coffee, our next planned stop was at Eileen Donan Castle where we had lunch, and of course took in the castle tour. As we crossed the Skye Bridge, I could sense Rose was as excited as I was. We weaved our way to Portree to pick up groceries to take to the holiday cottage we had booked. Now fully loaded, setting off on the last leg of the trip was most welcome, as we looked forward to arriving at the cottage around 6 o’clock that evening. I was happy as Larry driving along the A850 Portree to Dunvegan road. We’d just come round a bend and something ran on to the road. I still don’t know what kind of animal it was, it could have been a hare, because it moved fast. Instinct took over, along with a hundred and one thoughts. Was there anything behind me? I wasn’t sure. I knew there was nothing coming towards us on the other side, so I swerved rather than brake. It turned out to be the wrong decision, especially on such a narrow road. The car was out of control, the offside wheel hit stone on the ditch at the side of the road, and the next thing I remember was the car coming to a halt. We had catapulted over and landed on our side, drivers side down, facing in the opposite direction, there was vapour seeping into the car and we feared it was about to burst into flames. We managed to scramble our way out of the passenger door and jump to the ground. OUR SKYE ADVENTURE WAS NOT OFF TO THE START WE’D IMAGINED. Some motorists had stopped and called the emergency services. The police and ambulance crew were quickly on the scene, and we were whisked away to Broadford hospital. We were very lucky. Rose had a fractured wrist, a broken tooth, and a chest pain. I walked away with nothing more than a cracked rib and some aches and pains. After an overnight stay in hospital our Skye adventure continued the next day. The police phoned the hospital to say they had retrieved our belongings from the car, and we could collect them at the police station. I have to say, the police officers and the hospital staff were absolutely brilliant. They couldn’t have done any more than they did. When you travel by car you tend to take too much luggage because it’s so easy just to throw everything in the boot and load up the back seat, which we had done. So when we collected our luggage at the police station it was a bit of a struggle with only the three good arms between the two of us. 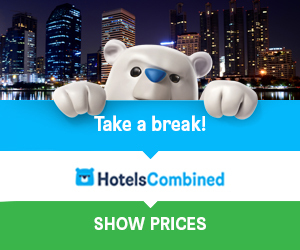 We decided there and then to see out the rest of our break and make the most of it, but we weren’t fit enough to travel that day. The Portree police, helpful as always, phoned around and found us a B&B for the night. The B&B was first class and next morning the landlady, Mrs MacLeod, gave me a number for car hire, which I arranged. Mrs MacLeod, a lovely woman, then extended her warm Scottish hospitality by helping us to load our belongings into her car and driving us to the car hire firm. THAT WAS AFTER SHE VERY KINDLY IRONED SOME CLOTHES FOR US! We finally got on the road again and arrived at our cottage in Glendale early Monday evening. The views from the cottage were absolutely staggering, and that proved to be a source of comfort as we settled down to reflect on the events of our Skye adventure so far. Tuesday morning, we decided to put everything behind us and we set out to enjoy what was left of our week. That wasn’t particularly easy to do, but the Isle of Skye has a magical quality, and that certainly helped a lot. 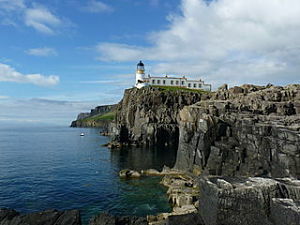 We began by visiting NEIST POINT, the most westerly point on the island, where the scenery is stunning. It was a lovely day, and we found some peace as we walked the trail to Neist Point Lighthouse, which is unmanned and stands 142 feet above sea-level. We finished the day with a visit to GLENDALE TOY MUSEUM, a converted house where the owner has an extensive collection of interesting toys dating from early 20th century. Next day our Skye adventure took us to see the fabulous DUNVEGAN CASTLE, which is a must-visit attraction if you’re in north west Skye. 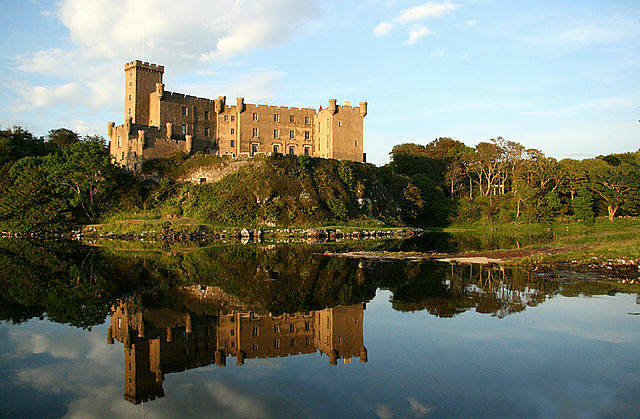 This great castle has been home to the Clan MacLeod for centuries and the 30th Clan Chief has residence there now. The castle tour follows the history of the Clan, and there is a video presentation by the Clan Chief that really helps you to understand the history of the place. The magnificent grounds that surround the castle are also worth exploring, featuring a walled garden and a water garden set in woodland providing you with a fabulous walk. The castle and garden tour combined price was very reasonable and it was really good value. 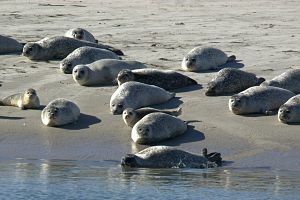 There’s a visitor centre with a gift shop and restaurant, and from the castle grounds you can access a boat trip to see GREY SEALS on the small islands. If you have visited the castle your ticket also covers the boat trip. The visit to Dunvegan was probably the most enjoyable part of our Skye adventure, and that night we rounded it off in grand style with a visit to the well known and popular OLD SCHOOL RESTAURANT for a truly delicious meal, with first class service. Other places we visited were Portree, the main town on the Island, and Uig, which is the ferry terminal for Cal-Mac sailings to Tarbert and Lochmaddy. All the towns and villages have something to offer the visitor, but they are well strung out. To get the most from your Skye adventure, it’s advisable to research the area and attractions before you go, and plan out your itinerary in advance, according to your interests. We returned from Skye to let our wounds heal, but with some good memories, and obviously some we’d rather forget. Did it put us off? NO! Would we go back? YES! 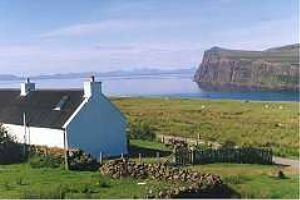 There’s lots to do and see on the Isle of Skye, but you will need a car as many places are quite remote. That’s a small price to pay for some of the most beautiful scenery, peace and tranquillity, wonderful wildlife, and a nice warm Scottish welcome.